I actually just bought this along with Harvey Penick's Little Red Book. They're both great reads. Even if you don't incorporate anything from them into your game it's still cool to read things from the viewpoint of someone who knows the game inside and out. With more than 1.5 million copies in print, Harvey Penick's Little Red Book (the bestselling sports book ever) and its bestselling companion, And If You Play Golf, You're My Friend, have become classic must-reads for anyone who has ever picked up a club and taken to the links. 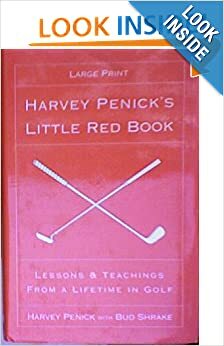 Since the publication of Harvey Penick's Little Red Book, millions of golfers have learned why this gentle, wise teacher is a true national treasure.